Fall is prime allergy season in Dallas, Texas. Your home can become a host to numerous allergens including dust, pollen, dander, and mold. Use some smart strategies to minimize the allergens in your home, and you can reduce both asthma and allergy symptoms. Curtains offer a cozy home for dust, dander, pollen, and other allergens that can enter the dwelling through open windows. Close up your windows for the season, and make sure they’re properly sealed with weatherstripping at the bottom. Caulk any cracks or holes around the window frame and sill. Take down your curtains or draperies and launder them to get rid of accumulated allergens. Do you have a lot of items that are stored in open boxes or bins? This offers a place for allergens to sneak in and settle. Store toys, craft supplies, and similar items in sealed plastic bins to help them stay clean. Keep out-of-season clothing sealed in plastic garment bags or boxes. Eliminate knickknacks and clutter as much as possible so dust is easily wiped away in your regular cleaning routine. You should change your HVAC filter about once a month. Stick to a strict schedule if you have asthma or allergy sufferers in your home so that you’re discarding the accumulated dust and dirt frequently. Keep a stash of extra filters on hand so you can quickly make the swap without any hassle. Mold often makes a home in the damp soil of potted plants. You can help contain the mold simply by spreading a thin layer of aquarium gravel over the soil in all your potted plants. As an added bonus, this will give your indoor greenery a more decorative look as it does double-duty keeping your air clean. A clean filter is only part of the battle when you’re eliminating allergens from your HVAC system. 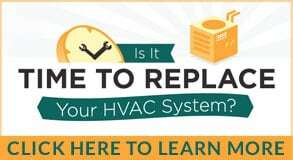 Don’t forget to schedule regular maintenance for your system as well. Contact Bill Joplin’s at 888-414-4655 to make your appointment now.